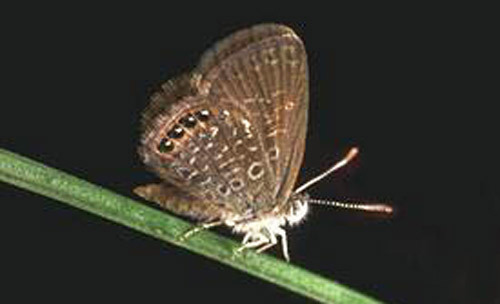 The eastern pigmy blue is our smallest eastern butterfly. It is found near saltwater—particularly in salt marshes where its host plants occur. Figure 1. Adult eastern pigmy blue, Brephidium isophthalma pseudofoea (Morrison). Photograph by Jerry F. Butler, University of Florida. The eastern pigmy blue is found in coastal areas from southern South Carolina to southern central Florida on the Atlantic coast, from the tip of peninsular Florida up the Gulf coast through the Big Bend Area, and from the western panhandle of Florida to eastern Louisiana. The wingspread is 3/4-5/8 inches (19-23 mm) (Opler and Malikul 1992). Undersides of wings are brown with a row of submarginal black spots with white highlights and are patterned with numerous white dashes and a submedian row of white circles. Upper sides of wings are brown with black spots without highlights. Eastern pigmy blue eggs are pale blue-green. 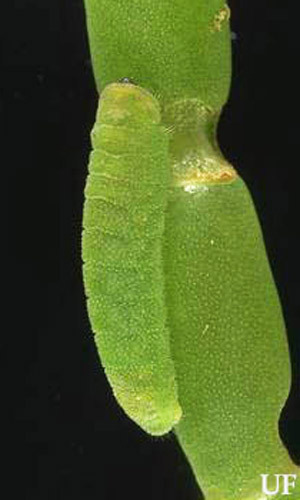 The larvae are green with small white tubercles that closely match the pattern on the glasswort host plant. Pupae are variable but usually yellow-brown with darker brown dots. Figure 2. Larva of the eastern pigmy blue, Brephidium isophthalma pseudofoea (Morrison). Photograph by Jerry F. Butler, University of Florida. There are many flights all year in Florida. Males patrol near host plants and courtship occurs in late afternoon. 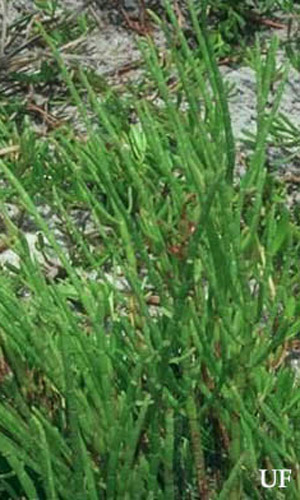 The primary larval host plant is annual glasswort, Salicornia bigelovii Torr. (Chenopodiaceae). Perennial glasswort, Salicornia perennis Mill. and saltwort, Batis maritima L. (Bataceae) also may be used. In the Florida Keys, larvae are attended by ants (Tapinoma sessile [Say]) which stroke them and feed from the dorsal nectary gland on the seventh abdominal segment (Harvey & Longino 1989). Figure 3. Annual glasswort, Salicornia bigelovii Torr. (Chenopodiaceae). Photograph by Donald W. Hall, University of Florida. Gerberg EJ, Arnett RH. 1989. Florida Butterflies. National Science Publications, Inc. Baltimore, MD. Harvey DJ, Longino J. 1989. Myrmecophily and larval food plants of Brephidium isophthalma pseudofea (Lycaenidae) in the Florida Keys. Journal of the Lepidopterists’ Society. 43: 332-333. Publication Date: August 1999. Latest Revision: August 2016.